Rachel Gearhart writes: This week, we are doing something different. We are analyzing two charts - one that exposes a huge threat to your retirement and another that shows how you can protect yourself. 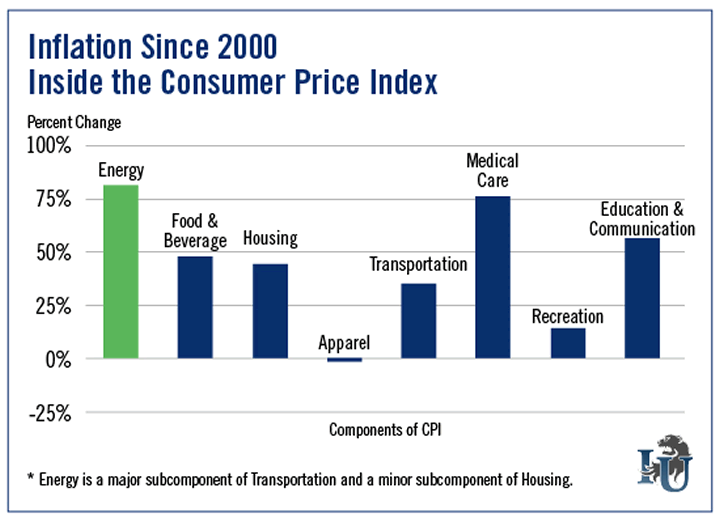 Since 2000, inflation has significantly increased prices in nearly every component of the consumer price index (CPI). The only exception is Apparel. This hits people who rely on fixed income the hardest. As prices go up, there is no cost of living raise to offset them. And with retirees consuming 36% of total U.S. medical expenses, the 75.7% rise in Medical Care costs is especially concerning. In it, we compare indexes for the three fastest-rising CPI components - Energy, Healthcare and Food & Beverage - to the broader market. 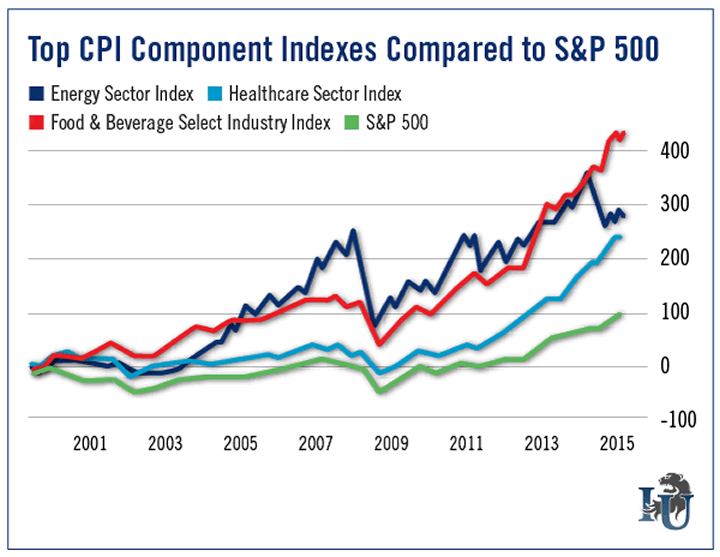 While food, healthcare and energy costs have risen more dramatically than other CPI components, these sectors have historically outperformed the S&P 500. Since 2001, the Food & Beverage Select Industry Index (SPSIFB) has shot up more than 427 points. That’s more than four times the S&P. It’s actually quite simple. A growing population... shortage of water... and rising demand for meat in emerging markets have steadily driven up food costs. This is partly why The Oxford Club’s Emerging Trends Strategist Matthew Carr has recently advocated investing in the Food & Beverage industry. He’s particularly bullish on fast-casual restaurants like Chipotle Mexican Grill (NYSE: CMG). While it may feel a bit backward, the charts speak for themselves. Investing in the sectors that are most susceptible to price increases is a great way to hedge against rising inflation. Editorial Note: By now, you've no doubt heard about the massive data breach that just hit 4 million federal employees. According to officials at the U.S. Senate Intelligence Committee, last names... birth dates... and Social Security numberswere all compromised. This is just the latest in a string of foreign cyberattacks on the U.S. And the worst part is: Their frequency is increasing. Fortunately for investors, crisis breeds opportunity. To find out which publicly traded companies are helping put an end to cyberterrorism - and making a fortune doing it - click here.